On the border between the swedish provinces Dalarna and Härjedalen lies the idyllic mountain village of Lofsdalen. The name of the village was once “Lovsjungaredalen” (the valley of praise). A place which attracted settlers thanks to the beautiful location and good hunting and fishing possibilities. Today it is the mountain Hovärken with its ski slopes that attract most people to the village in winter and hiking in summer. 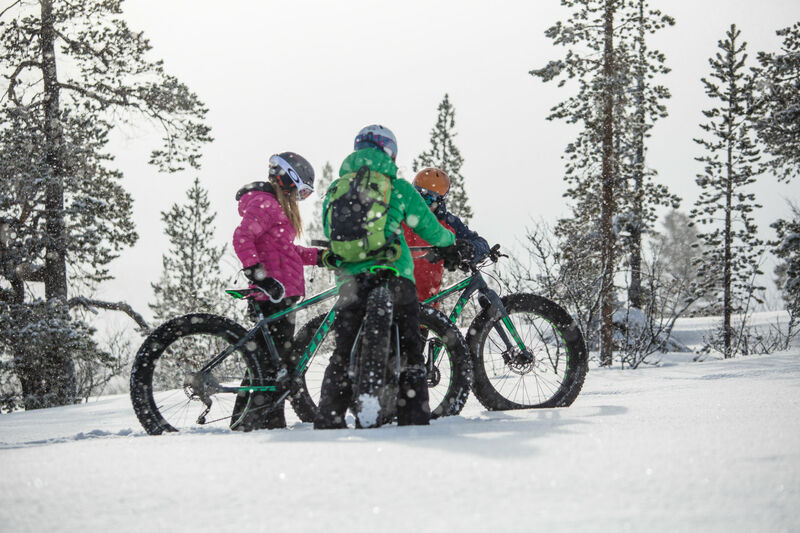 The soft and rolling mountain plateaus around Lofsdalen are also suitable for a more unusual activity; winter cycling. 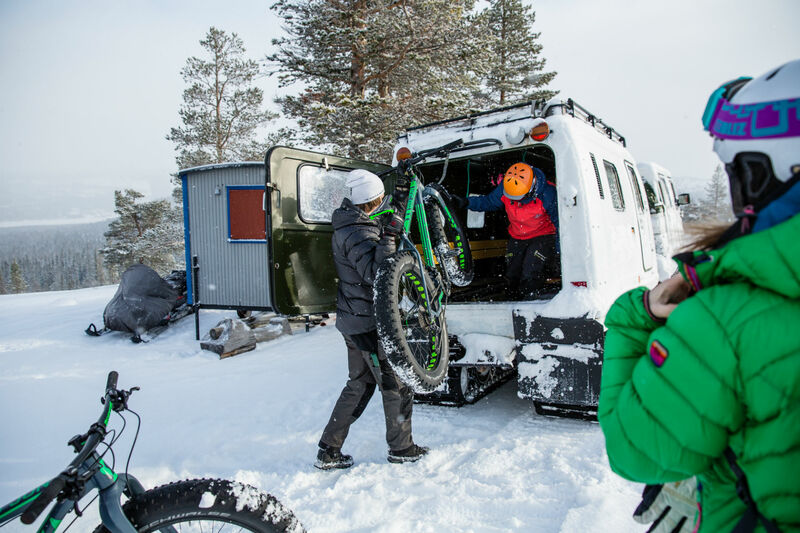 The bikes are loaded into a snow-trac and we get ready for departure. The Snow-Trac shakes at the start and then moves across the frozen lake Lofssjön. We leave the village behind us and head up to the waffle hut with the simple name Våffelstugan (The Waffle Hut). Snowpowdered spruces surround the track we go on. The sun tries to penetrate a light snowfall, creating a soft golden and beautiful shine. After twenty minutes we arrive at the Waffle Hut and unload the bikes. It feels strange when the bike is led in the snow. Skiing in the mountains gives a familiar feeling, but cycling feels odd to us. And at the same time exciting. We make our first tentative pedal movements and then we are off. After a number of laughs and falls into the snow we get the hang of it. The wide tires roll easily as long as you do not get outside the snowmobile tracks. The light cold snow that came during the night has embedded the whole mountain, including the tracks. This means we get to make the first tracks as we’re out early. A creaking noise is heard when the tires plunge into the powder. Everything is white around us with windswept birches sticking out as we cycle our way further into the fells. Lofsdalen´s mountain, Hovärken, can be recognized from far thanks to it´s shape. To the left of us there is another mountain called Sömlingshågna. The cyckle tour goes around a mountain called Stenruten, it is 5 km long and is on a trail for snowmobiles. It is marked out with wooden posts and a red cross on top made from two red wooden planks. After having cycled a few kilometres we are feeling daring and go faster, especially in the slopes. Needless to say, this results in some spectacular crashes in the snow and we regret not having brought our helmet cameras… Luckily there are soft landings in the powder-like snow. Once back at the Waffle Hut it fits well with a crispy waffle, cloudberry jam and whipped cream. Skiers, cyclists and snowmobilers all get together here and share their adventures. Although the means of transport are different, the joy of being in nature is the same. Cycling fatbike is an excellent family activity. Guaranteed, the kids will challenge their parents and win! The five-kilometer loop around the mountain Stenrutan fits the active family with slightly older kids. Some kids may rather like to go up with the Snow-Trac and then go down on Fatbikes without doing the 5 km loop. The smallest kids will be perfectly satisfied going up to the waffle hut in the Snow-trac and down the same way. For a group of friends you can all go and choose your own style. Going up with the Snow-Trac or cycling up (5 km), doing the 5 km loop or not and then all gather at the Waffle Hut! – Needless to say, the way downhill from the Waffle Hut can be quite fun to do together. The Tourist Office in Lofsdalen will be happy to guide you to the best tour of the day for your needs and likes. 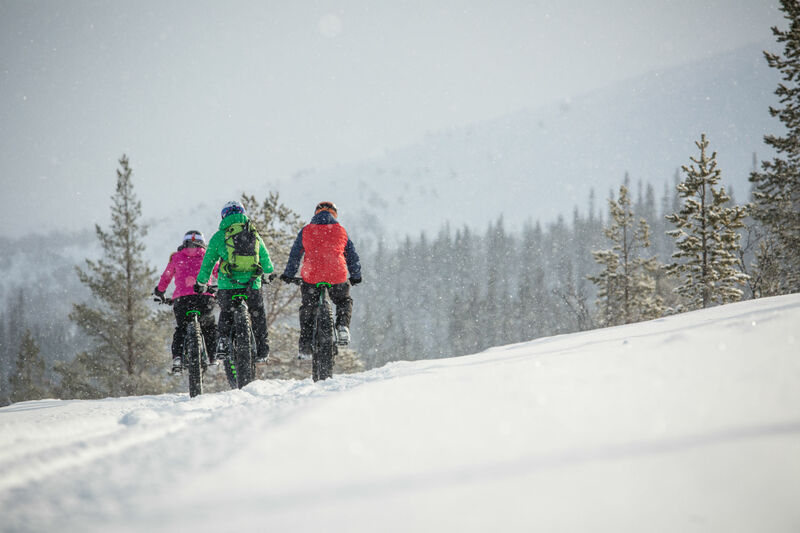 As a fatbike cyclist, you share the trail with others, both skiers and snowmobilers. You as a cyclist are unusual to meet and your movement patterns as well as speed are not familiar to others. Therefore, pay extra attention and exaggerate your signs to let others know of your attentions for example when changing direction. In Lofsdalen there are 9 lifts and 25 ski slopes as well as 115 kilometers of groomed tracks for both classic skiing and skate. 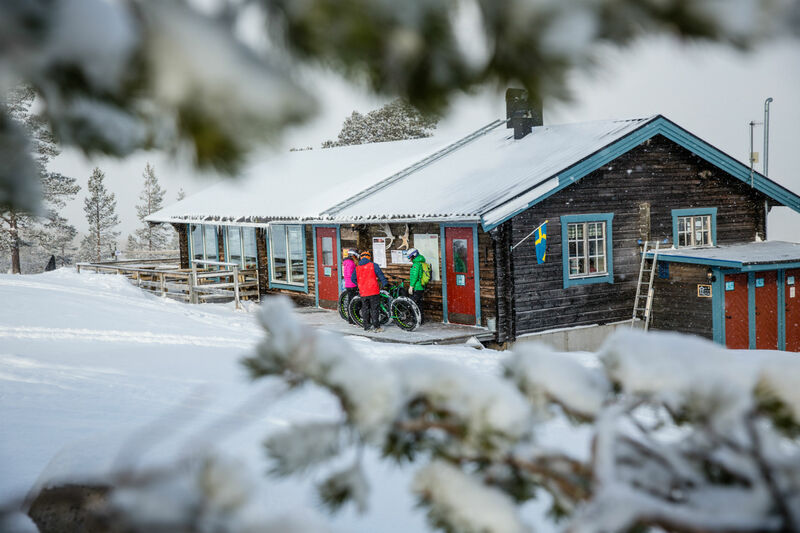 A visit to the Aktivitetshuset (the Activity House) should also be included in each stay. The kids are likely to want to do more than one visit since this is where you can go bowling, play shuffle board, try shooting and golf in a simulator. There are also labyrinths to climb round in, a slide and an inflatable bouncy castle as well as a colourful ball pit to swim around in. Winter or Winter Spring (February-April, when days get longer with sunny days and cold nights). Easy, Medium or Hard – Depending on the chosen tour and snow conditions. Take the train to Sveg and then regular bus to Lofsdalen, or go by bus from Stockholm “Härjedalingen” all the way to Lofsdalen. Skip the Snow-Trac and use only your own energy for the tour. 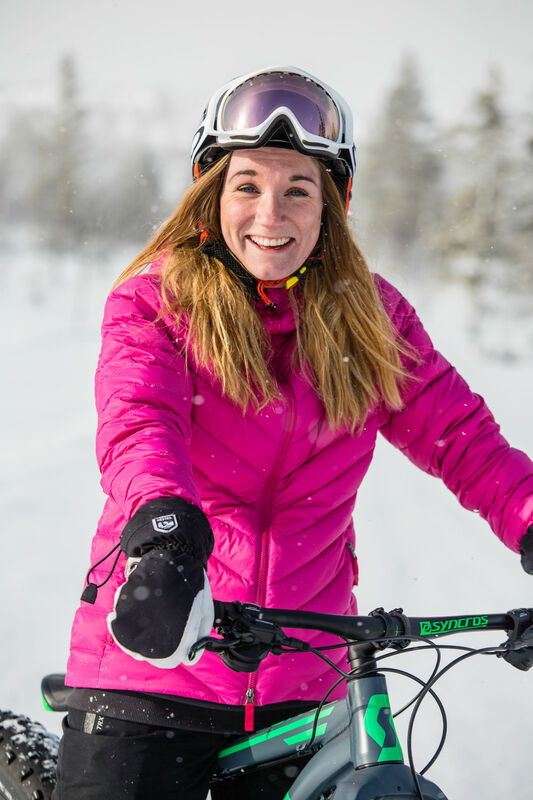 Rent your fatbike at Karin´s Sportbod in Lofsdalen. 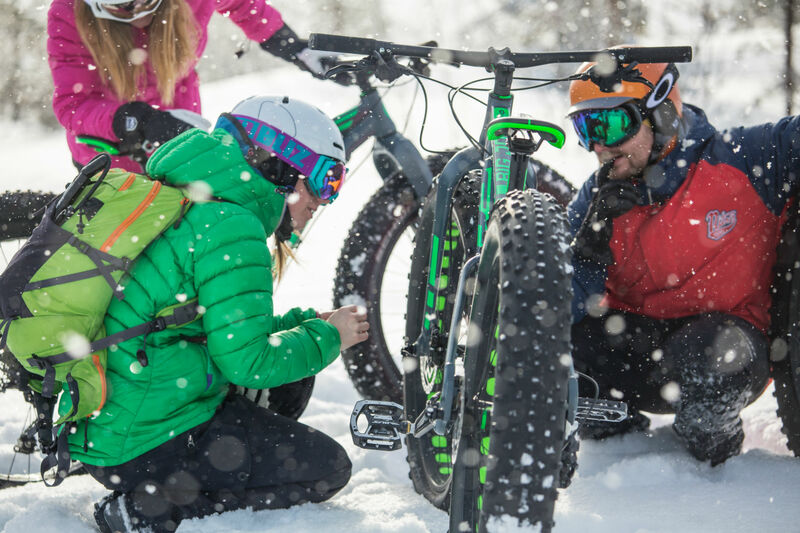 A fatbike has wider tires than a normal bike, hence the name, to make it steady on snow. By pumping the tires differently (more or less air) you can get the tires to adapt to current conditions. Hard tracks needs more air and soft tracks less air in the tires. Remember helmet and goggles to protect your eyes from wind and snow. Wear warm gloves. You will get warm as you cycle, bring an extra sweater to put on for breaks along the way. And do not forget to bring water. Older frozen snow is always easier to cycle than fresh powder. Ask for a suitable tour suggestion as you rent your bike or at the Tourist Office. Do not rely on your mobile phone in case of an emergency. Remember to check the weather report before you go and notify someone of your attentions. More on Mountain Safety. Please note that it is not allowed to go biking in the groomed tracks made for XC skiing. You are sharing the mountain trails with snowmobilers and skiers. Follow directions and show elaborate signs of your attentions when changing directions to avoid accidents. Step aside when the snowmobilers pass in higher speeds than you can keep as a cyclist.